I like the think I’m a reasonably savvy observer of public opinion and international economics, but every so often I’m stunned by some bit of data. Several years ago, for instance, I was very surprised to see that more than half of the French people would consider moving to the United States if they had the opportunity. Well, the French have shocked me again. According to new polling data from Pew, the people of France support spending cuts over spending increases by a margin of 81-18, an astounding result. I’m also surprised that the Spaniards and Italians support spending cuts. The polling results are especially impressive considering that Pew asked the question in a very biased way, presupposing that Keynesian economics actually works. The fact that so many European saw through this inaccurate wording is very encouraging. By the way, I can’t resist sharing this part of the Pew survey. It shows that the people of all eight nations think they’re the most compassionate. On a humorous note, the folks from every nation chose the Germans as the most trustworthy – except the Greeks, who chose themselves. With my twisted sense of humor, this reminds me of the funny (but un-PC) maps showing how the Greeks (and folks other nations) view the rest of Europe. And since we’re being politically incorrect, here’s some English humor about terror alerts in other nations. P.S. 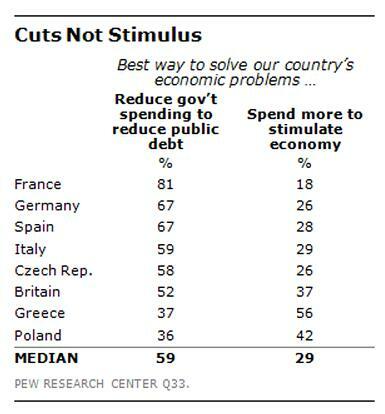 It turns out the French people also supported spending cuts by a very strong margin in a 2010 poll. So there’s something nice about the country other than attractive women. But given those poll numbers, why the heck do they elect big-government statists such as Sarkozy and Hollande?!? P.P.S. Since I’m a proud America, I can’t resist linking to this poll which shows people in the United States favoring spending cuts by a margin of more than 8-1. So why do we elect big-government statists such as Bush and Obama?!? I just do not feel sorry for a nation or the people who vote for their own demise. Let me come out right now and say: (a) I benefit significantly from the mortgage interest deduction. And I think that’s an absurd deduction and ought to be abolished. It is not at all clear to me why if two people have the same income, and one pays $X per month for rent while the other pays that same $X per month on a mortgage, the one paying rent should have higher taxes. (b) I benefit from the college tuition tax credit. I think that’s also absurd. The main people to benefit from my kids getting a college education are my kids. I don’t see why somebody else should subsidize my kids’ education. And if you’re about to ask why I claim these deductions if I think they’re absurd and unfair: It’s because if I don’t claim them, I will still have to pay the higher tax rates to subsidize all those who do claim them, plus all those who claim all the other deductions that I think are absurd and unfair. I don’t get to make up the rules: I have to play the game by the rules that others have made up. Ann L in LA, you are spot-on. The fact is that the average American, even those of the right and tea-party affiliated, are not as anti-tax and anti-big government as they claim to be. They are all entitled just like the progressives though, perhaps, to varying degrees less so. They talk a good game but that’s all. When the chips are down, they are just as dependent-minded as the progressives they love to loathe. This explains why Republicans and conservatives contributed to the deficits and debt while giving rational excuses for why it happened. Even during Reagan’s time enough was not done to deal with the debt and deficit. Alas, the true small government persons will have to make a choice sooner rather than later. Fight harder or simply leave and go elsewhere where people really know not to depend on the government because there is no government to depend on. Despite what Dr. Mitchell thinks, his fellow countrymen on the right are not limited government at heart. They are only limit the other person’s government at heart and that is why the country is how it is. Persons in the Third World know what true limited government is because there is no safety net or welfare state to depend on. The best part of that survey is th Italians. They are the only ones in the survey to call THEMSELVES the least trustworthy, and not to call themselves the least arrogant. Gotta love the Italians. Realists to the bone. on May 15, 2013 at 11:10 am Ann in L.A.
Everybody everywhere supports spending cuts…just not the ones that would affect themselves. I’ve been disappointed in polling of Tea Party leaning people; when asked questions about what they actually want to cut, all of the benefits that they might received (you know, like the big ones SS and Medicare,) they scream “hands off!” just as loudly as everyone else. They like cuts in general, once asked what they would like to cut they can’t think of anything – because they are entitled to it. So nothing ever will be cut until civilization collapses. So why do we elect big-government statists such as Bush and Obama?!? Because we are never offered a real choice. It is progressive left or progressive right. Freedom and small government seem not to make it to the final menu. This reminds me of the joke regarding European heaven and European Hell. In European heaven, the Germans would make the cars, the French would be the cooks, the Swiss would run the trains, the Italians would be the lovers and the English would be the Police. In European hell, the French would make the cars, the Swiss would be the lovers, the Italians would run the trains, the English would be the cooks and the Germans would be the police.